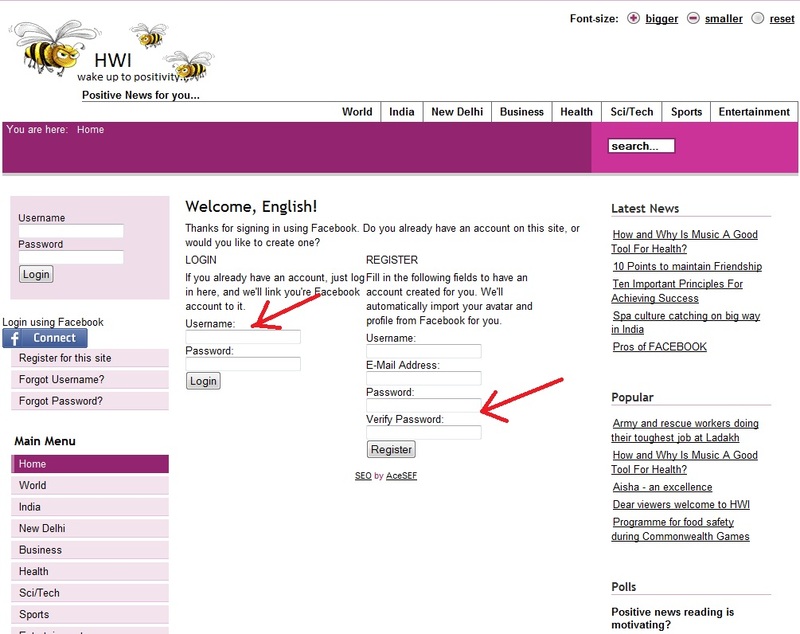 Step 2: Enter your facebook ID and password in the Facebook window to connect with Healthy Wealthy India.com website. 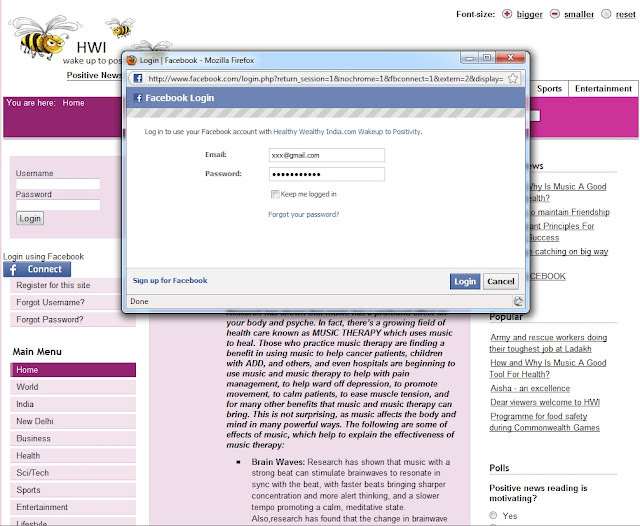 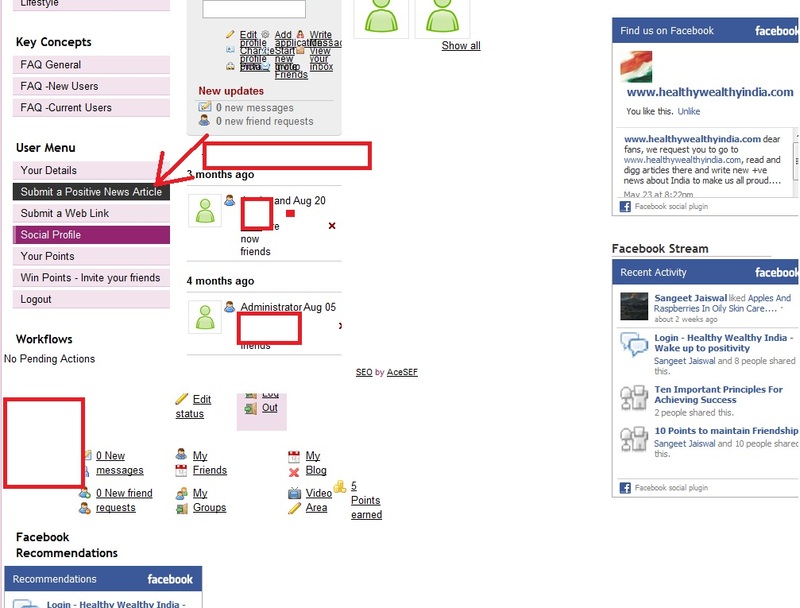 If you do not have a facebook ID, we suggest you to go to http://www.facebook.com/ and create a new Facebook ID. 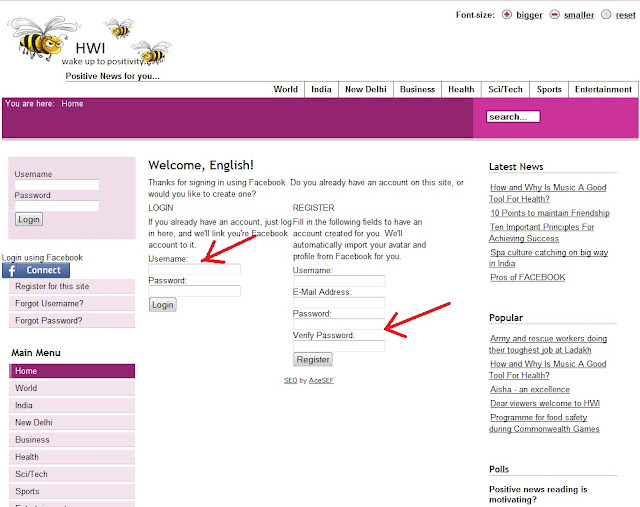 Step 3: Now under Register Section enter any username desired by you, your email address, create your login password, and then enter the same password again to confirm it. Step4: When you click Register button. 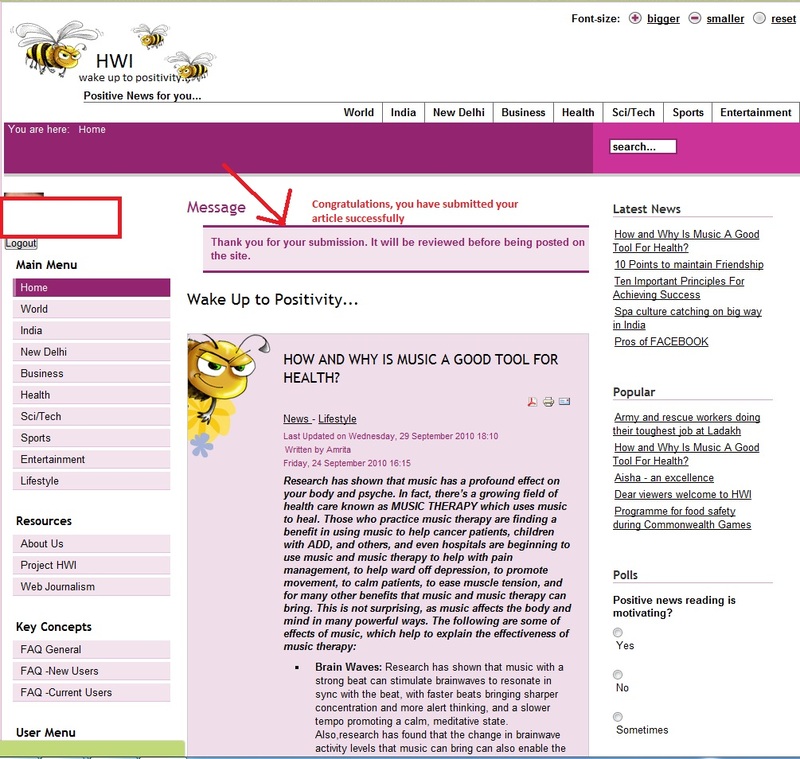 You will get a message congratulations, your facebook profile has been added to this website and you will get a point because you created your login. 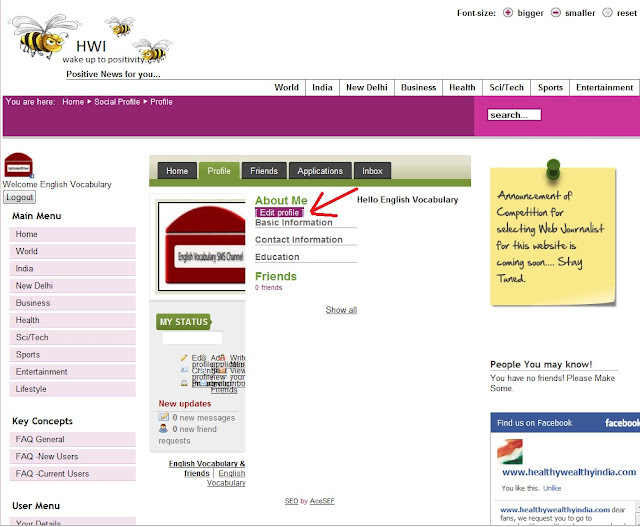 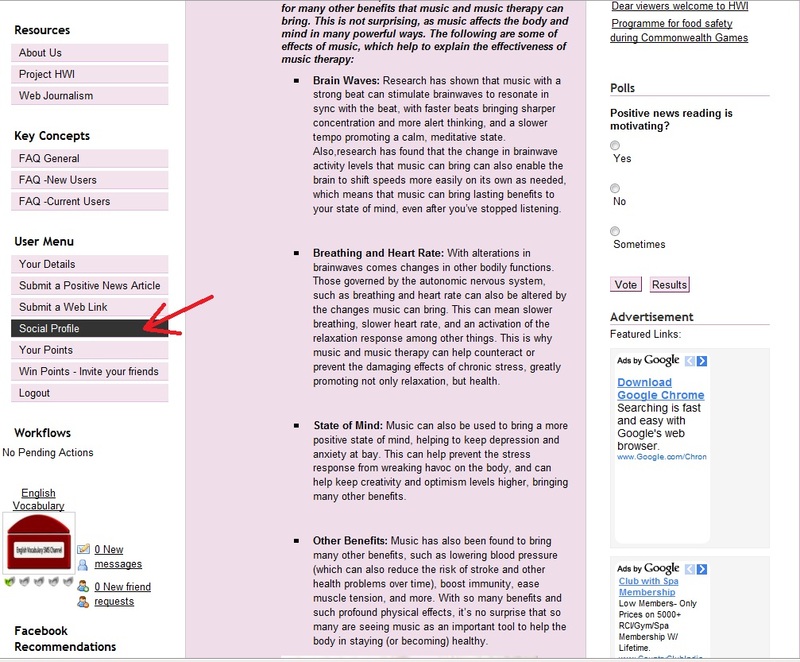 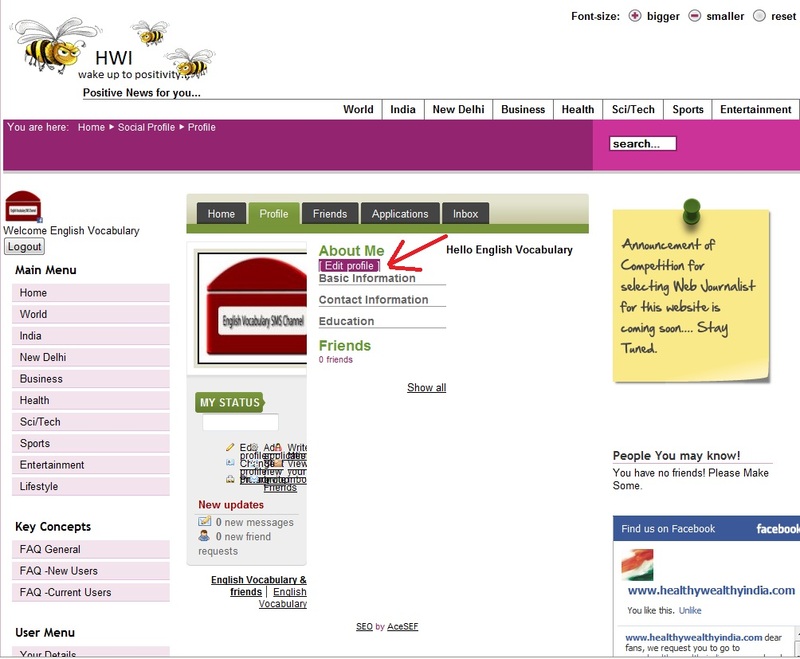 Step 5: Now scroll down at Healthywealthyindia.com website, you will see under User Menu > Social Profile Click on that. Step 6: Now under your profile section, just below About Me, click on Edit Profile. 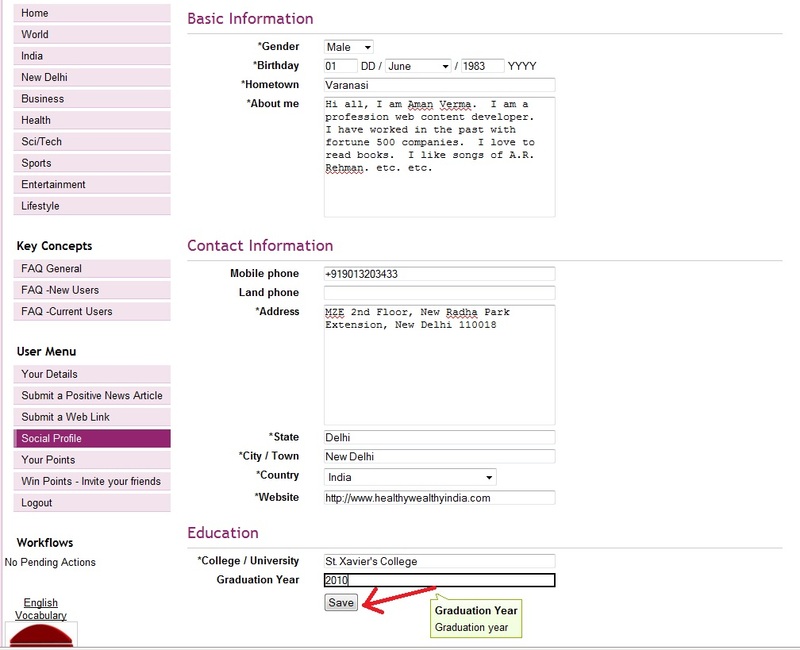 Step 7: Now enter your actual basic information in the appropriate sections and click SAVE. 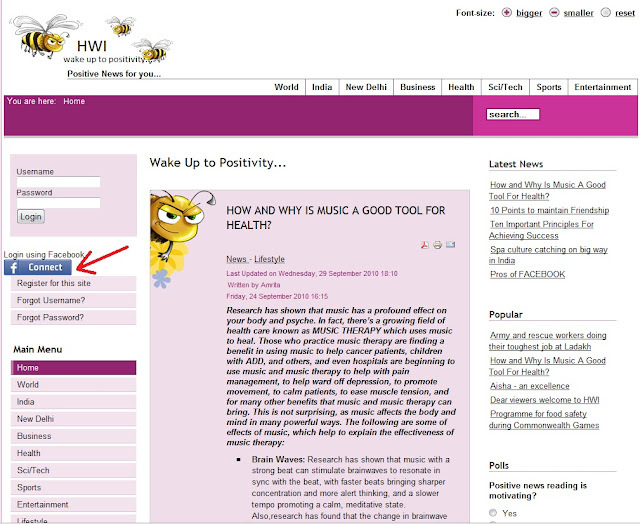 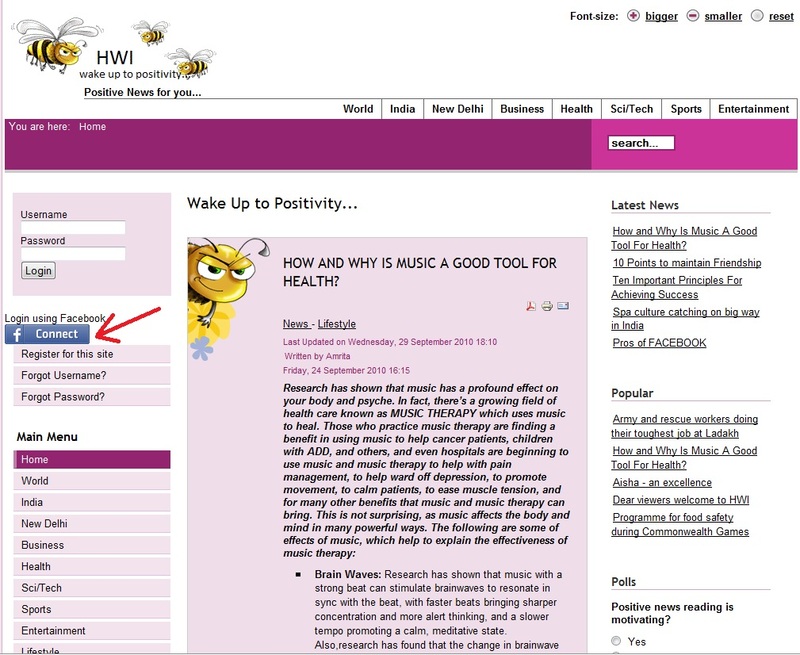 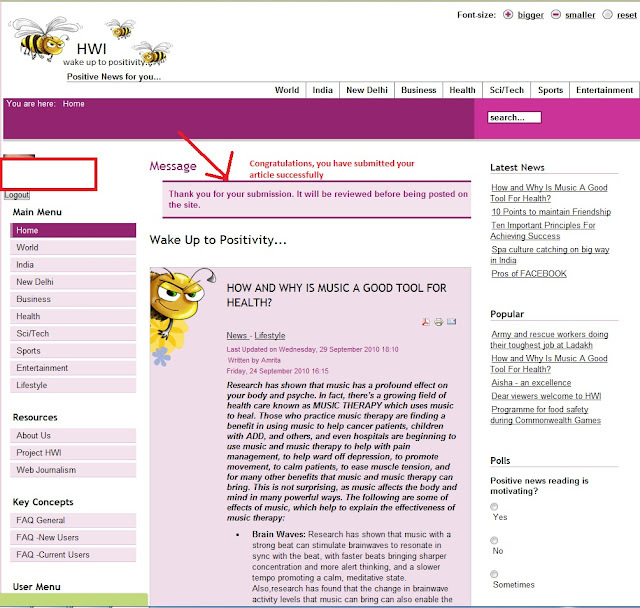 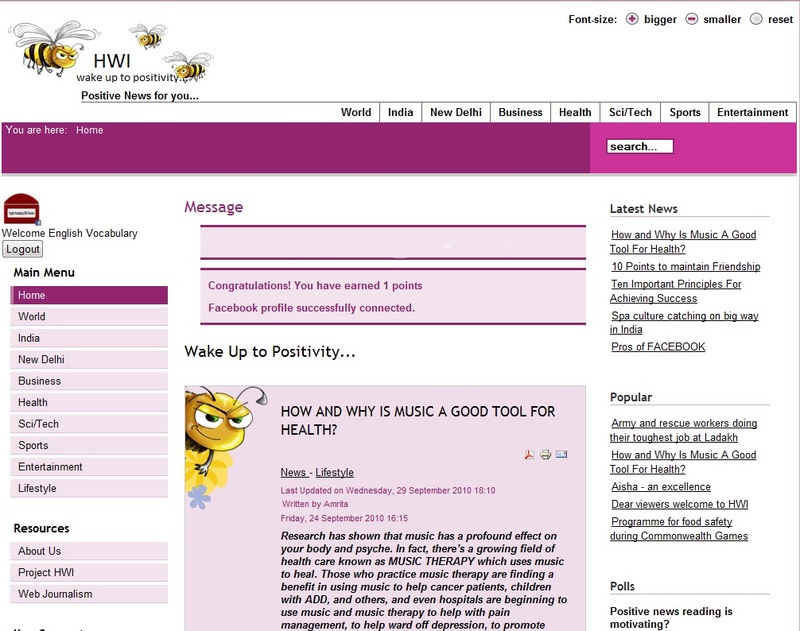 Step 8: Now go back again to the User Menu > and this time select Submit a Positive News Article. 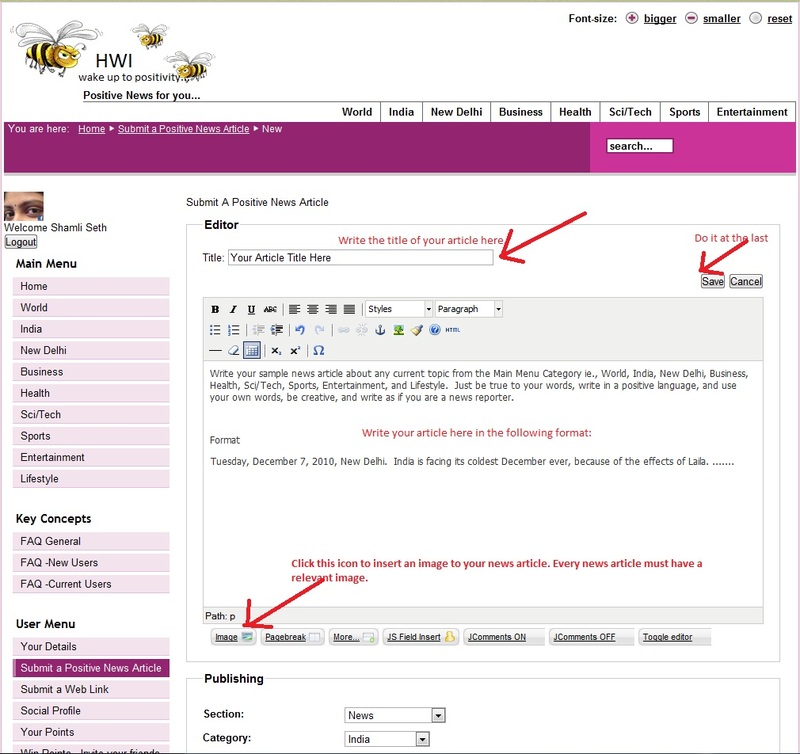 Step 9: Now write an Appropriate title for your News Article, then write your article in the space provided, place your cursor at the place where you want to insert a photograph and click on Insert button to insert an image in to your article. 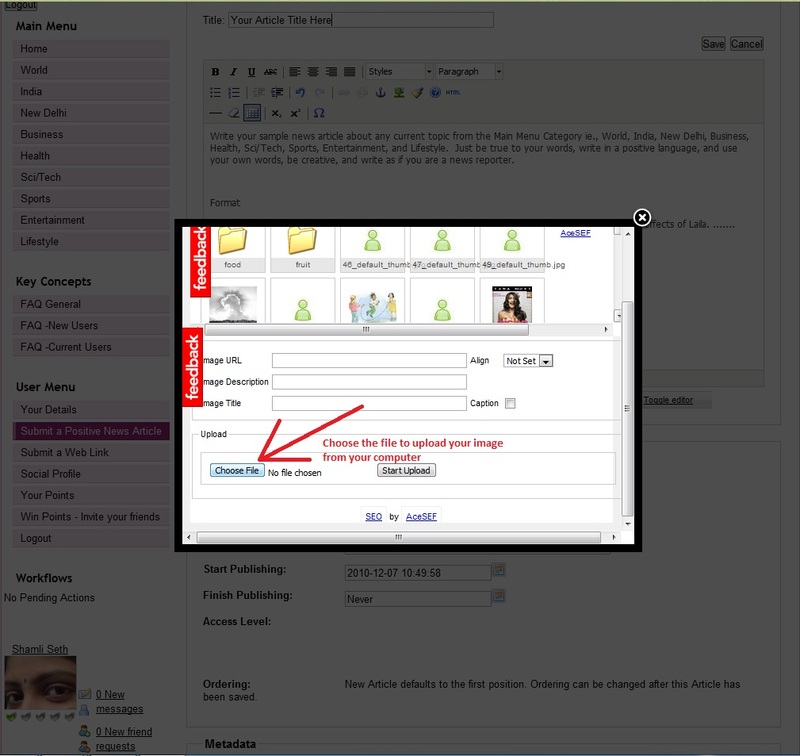 Step 11: Now scroll down in the popup window where the images are shown, and select the image that you have uploaded, write a description about the image in Image Description and give a proper name to the Image in Image Title, when done, then finally click Insert Button at the top of the popup window. Step 12: Now scroll down where you have written the article and go under Publishing Section > Section > here select the section **NEWS** Note it is important to select only this section, as you are posting a NEWS article. 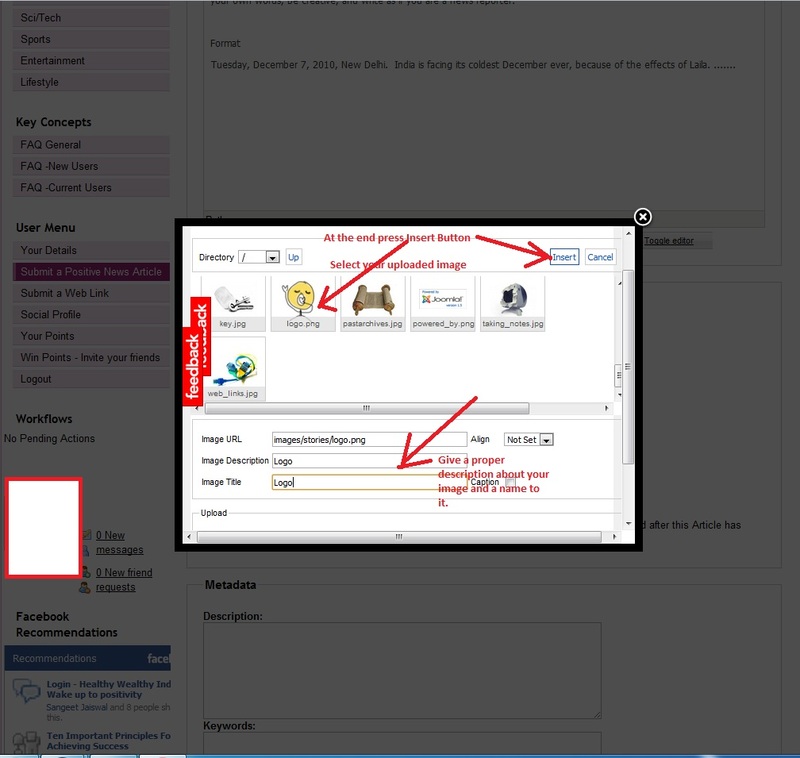 Then under category select the appropriate category in which your news article belongs to, for example, if it is a news about our country, then select India, if it is a news about sports, then select Sports, and so on. 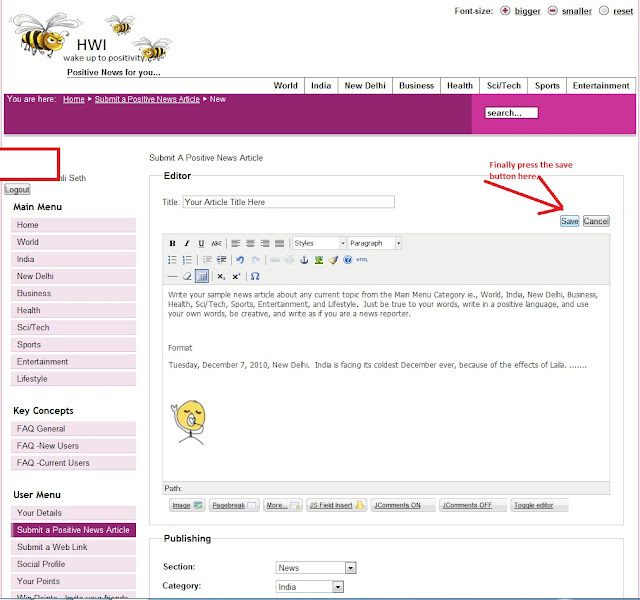 Now under Author Alias : Write your name here. Start Publishing, Finish Publishing, and Access Level, leave them as it is. 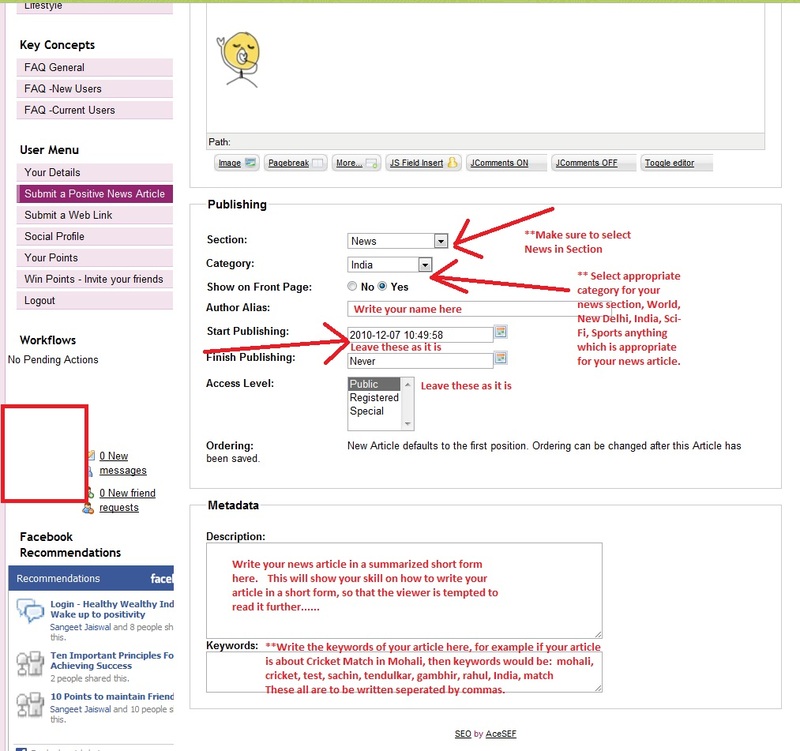 Step 14: Congratulations you have published your News Article, it will be reviewed at our end, and a final confirmation will reach you via email. 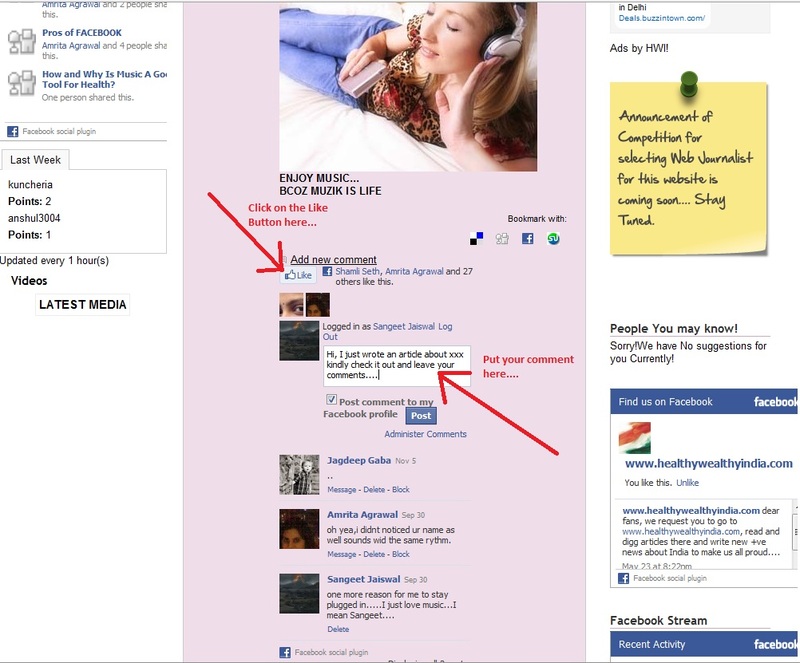 Step 15: Once you have received the confirmation that your article has been published, visit our website at http://www.healthywealthyindia.com and find your article there, and then click on the Like Button and comment and share your article with your friends on Facebook, also share the link of your article at Twitter etc. Make your friends to comment on the burning topic of your news article and let them participate in your conversation. 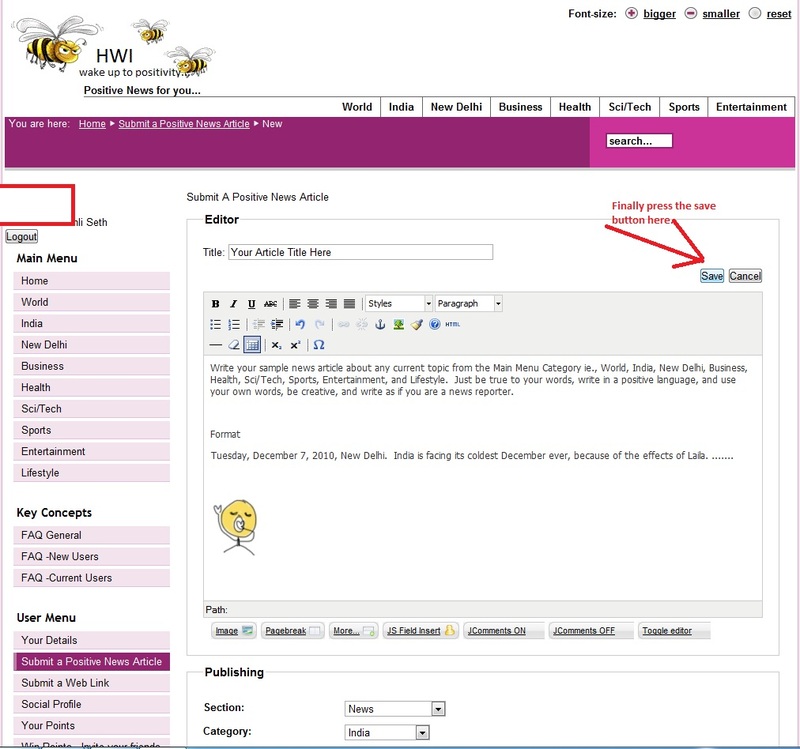 In short popularize your article using social medium.